If given the right kit, even a soft cell—an adipose stem cell, for example—could join the anticancer fight, suggests a team of scientists based at ETH Zurich. This team, led by Martin Fussenegger, Ph.D., a professor of biotechnology and bioengineering, reports that it can equip nonimmune cells with additional components, and muster ranks of synthetic designer cells that mimic T cells. Details appeared November 13 in the journal Nature Chemical Biology, in an article entitled, “Nonimmune cells equipped with T-cell-receptor–like signaling for cancer cell ablation.” The nonimmune cells, the article emphasized, could contribute “to the advancement of synthetic biology by extending available design principles to transmit extracellular information to cells.” That is, synthetic T cells could be equipped with different docking sites, in modular fashion, to attack selectively different targets. The ETH Zurich scientists developed a sort of sensing and triggering device that can function in human nonimmune cells. The device, a signal-transduction apparatus, can sense when it contacts a target cell and then trigger the release of output molecules. Although T cells are being engineered to combat tumors more effectively, their deployment in immune-cell therapies can have significant side-effects. Also, the production of modified T cells poses serious technical difficulties. Human nonimmune cells modified to incorporate custom cell-contact-sensing output devices, however, could extend the applicability of cell-based cancer therapies. In addition, these synthetic T cells might avoid the risks associated with engineered immune cells. One of the components of synthetic T cells entails molecular antennae protruding well outside the membrane. Also embedded within the cell membrane are antibodies with specific docking sites, which can sense the target structures of the cancer cell and bind to them. The third component is a gene network that generates a molecule complex. This molecule complex constitutes a molecular “warhead” that penetrates the membrane of the target cell. It is linked to a converter molecule that activates an anticancer substance in the tumor cell's interior. The precursor of this active substance needs to be added to the system externally. 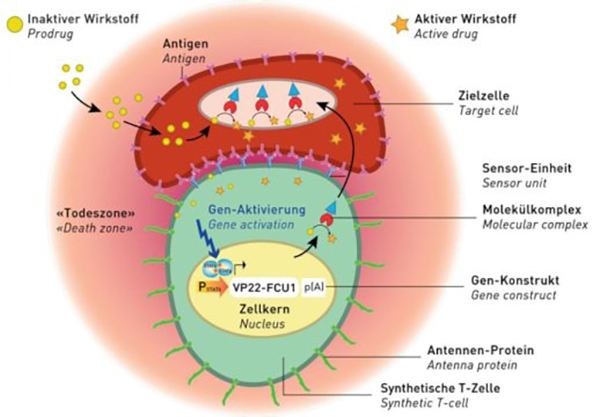 Cancer cells absorb this substance, and the converter module transforms the drug from a prodrug to an active drug state. The cancer cells bursts, and the active substance is released, destroying other tumor cells in the “death zone” around the synthetic T cell. The mechanism triggering the signal cascade leading to the destruction of the cancer cell is new, and has a physical function: as the synthetic T cell moves closer toward the target cell, the antennae proteins buckle. The antennae's anchorage deep within the cell therefore loses contact with a molecular switch that it had previously blocked. As a response to the ON command, a signal cascade is initiated which actuates the production of the molecule complex. The new type of artificial T cell has several advantages over current cancer treatments. Whereas during chemotherapy the body is flooded with active substances in order to kill as many rapidly dividing cells as possible in a very unselective manner, only a few artificial T cells are needed in the new therapy. What's more, these are only deployed locally and in a carefully targeted fashion. For the current study, scientists used docking sites that detect only one specific type of mammalian cancer cell. “This technology provides us with an enormous degree of generalization that cannot be achieved with the genuine T cells used in current cancer therapies,” Dr. Fussenegger stressed. Previous articleShort Stories to Peruse—With Info You Might Use….